Why not request a free no obligation home consultancy visit & Double Glazing Quote? 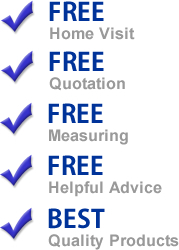 We cover the entire north west and offer a free home visit to discuss your requirements. Simply fill in the form below or contact us directly on the details below. You can enter your details below and we will get back to you to confirm your appointment. There are 3 day and time option boxes below. If you have a number of days and times during the week when you can be seen, then fill in as many options as possible. If not then just fill in option 1.